Make anything with Autodesk EAGLE. Bring your next spark of an idea to life with powerful, easy-to-use PCB design software made for every engineer. 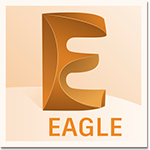 Note: EAGLE requires Autodesk ID with Education Benefits to work. Please note users will need to log in to use EAGLE after the software is installed to the computers.